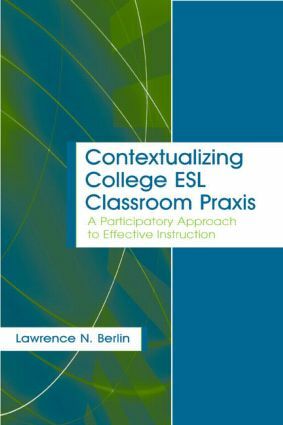 Contextualizing College ESL Classroom Praxis: A Participatory Approach to Effective Instruction provides pre-service and in-service teachers with a model for engaging in effective instruction with the variety of students encountered in college English as a second language or foreign language classrooms. Along with the model, the text is designed to help readers develop the tools to use it within a participatory approach. This approach, based on the principles of Paulo Freire's critical pedagogy, is combined with multicultural education and the general tenets of a communicative approach to language teaching. From the philosophical to the theoretical to the practical, these strands are combined into a cohesive whole. *What is the nature of process over product? *Is a new definition of effective instruction necessary? *What are the factors that can affect second language acquisition? *What do teachers believe about effective language instruction? *What do students believe about effective language instruction? *How do teachers and students relate in the classroom? *What does instruction mean for students? *How can effective praxis be adapted to various contexts? Each chapter includes Pre-Reading Questions, Post-Reading Questions, a topic for a Reflective Journal, and Follow-Up Activities. These provide opportunities to enhance comprehension of the material, to co-construct new knowledge with classmates, and to review personal beliefs and ideas in an effort to modify or reinforce them in one's own developing model for effective language instruction. "…an important contribution to the ongoing discussion on what constitutes effective English as a second language (ESL) teaching practices…Berlin's effective instruction model and participatory framework compel ESL teachers to reflect on and re-examine their perspective on the roles and functions of teachers, students, and the language classroom….this book provides language teacher educators with a valuable supplement to the more traditional texts found in ESL methodology and practicum courses." "The voices of the teachers and learners are rich….The approach is inspiring, and can leave readers with will for reflection, an awareness of the complexities of a living multicultural classroom, and with a motivation to embrace and encourage the co-construction of knowledge in a language learning environment." "Berlin guides the reader into a fully developed understanding of what it means to be engaged in a participatory approach to language learning. This approach, based on the combined principles of Paulo Freire's critical pedagogy and communicative language teaching, is more than a method, and more than an approach. It is an entirely new way to view the roles of teacher and students together….After reading this book, to become participatory on one's classroom becomes a haunting responsibility, if one claims at all to be democratic, a believer in social justice, or one who simply recognizes the uniqueness of each individual as a learner."